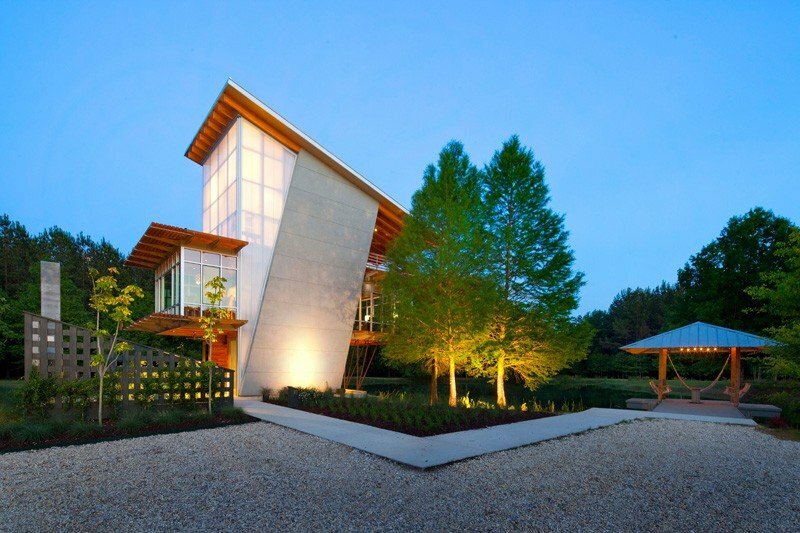 A sustainable house with a stunning design featuring an angled exterior. It isn’t the first time that you will see a house near a body of water. It is nice to have a house near the ocean or a lake or even a pond because the water will give the area that coolness and freshness. But aside from that, the house design matters a lot not just in the aesthetics but also the function as well. 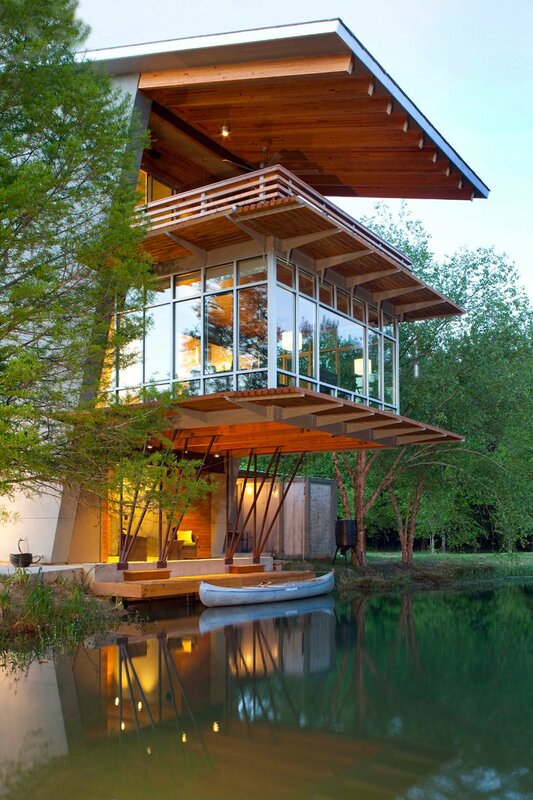 What we will feature today is a house that overlooks to a pond. Apart from the location, the house has a beautiful design that will surely turn heads. 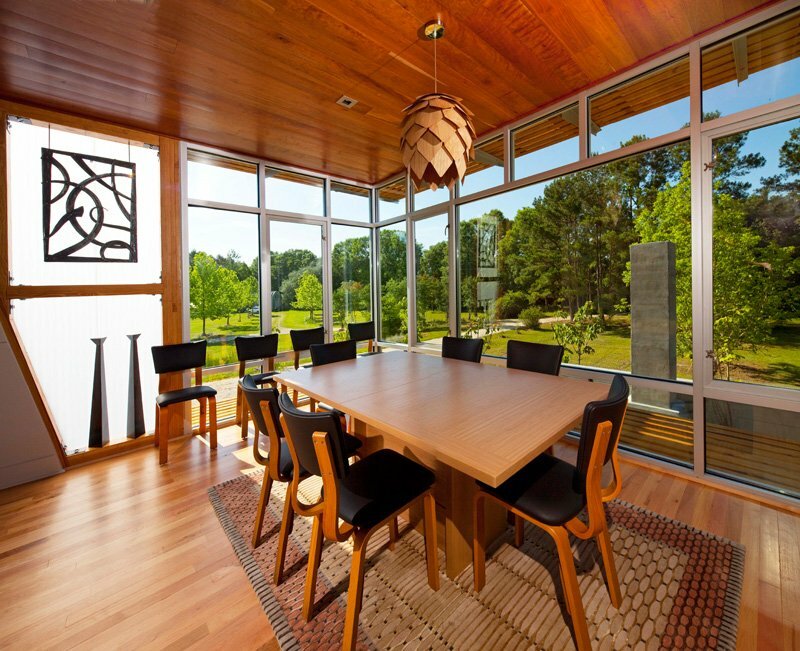 It is also sustainable and has a spacious surrounding showcasing nature’s beauty. The Pond House at Ten Oaks Farm has a lot area of 1,250 square foot located in Hammond, Louisiana. 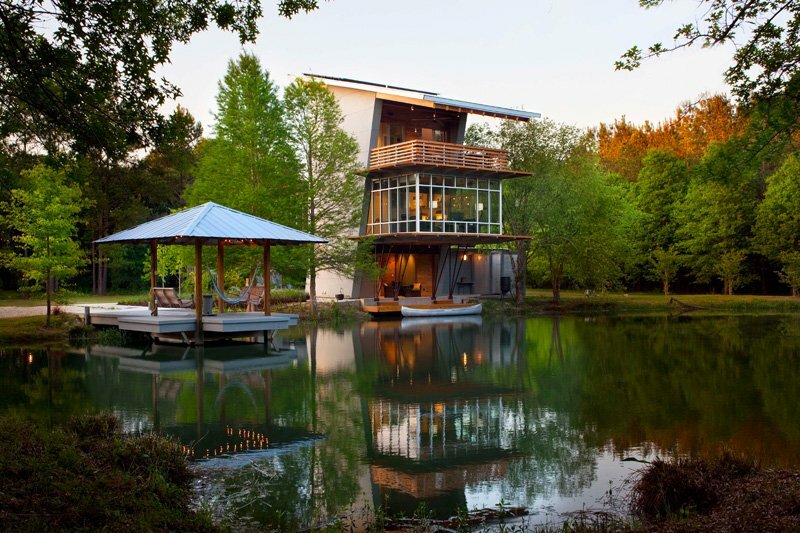 It is a net zero energy retreat located on a 15.5 acre site where a three-story structure sits over the edge of a pond. 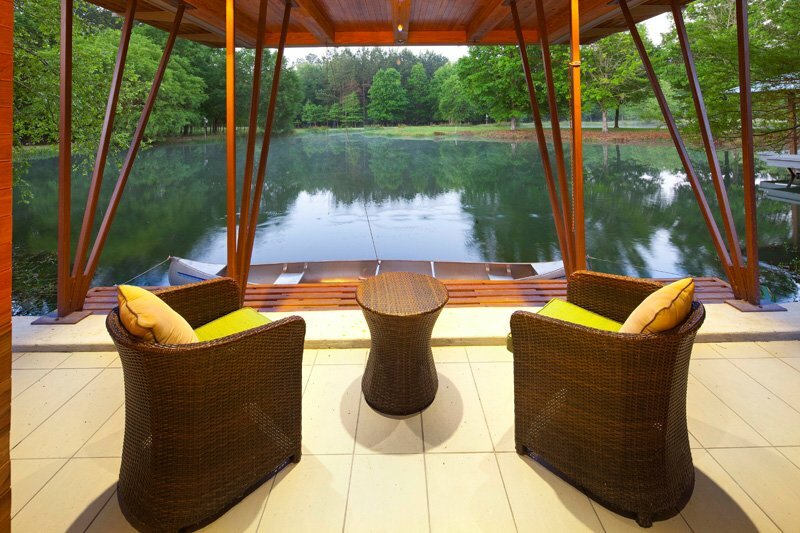 It also overlooks a peninsula of ten oak trees that stretch out into the middle of the pond. The house also features an outdoor area where the family can spend time on a fireplace and outdoor kitchen on the first floor. On the second level, it contains a living room, kitchen, and dining room where a panoramic view of the landscape can be seen. The master suite has an outdoor terrace on the third level that overlooks the property. One good feature of the house is a single-sloping roof that sheds rainwater into the pond while allowing maximum sun exposure for solar panels. The form of the house juts out at a 14 degree angle towards the water while the roof sits perpendicular to the structure. Because of this angle, it created a striking contrast between elements like the kitchen millwork and floor to ceiling windows in the living and dining room. 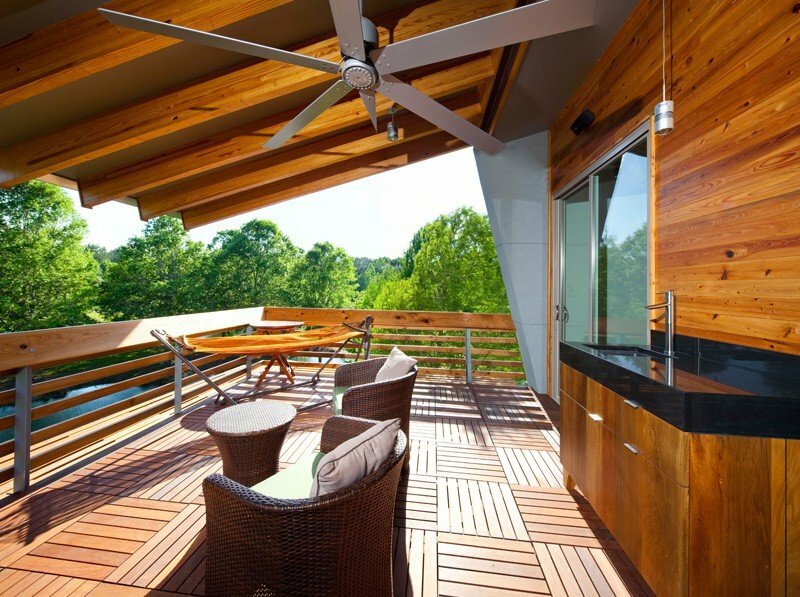 Unique feature: A contemporary house located near a pond with sustainable and energy-efficient features. The architecture of the house has a beautiful angled design with transparent walling. Beautiful. Anyone who sees the design of the house will no doubt agree with me that it is indeed beautiful. I love every detail of this house from the roof to the surroundings. It has a transparent look too which made it look even more gorgeous! 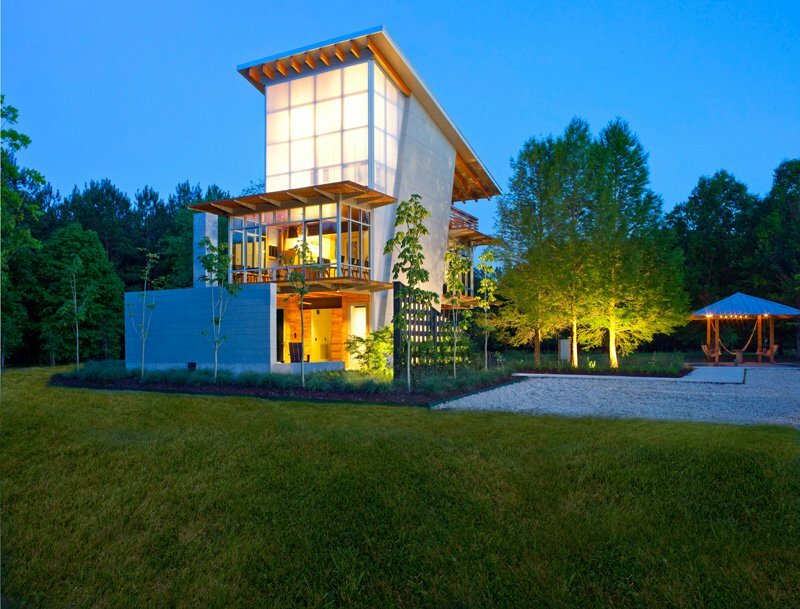 Since the completion of the house, it has been generating energy instead of consuming it. This house design is a proof that even sustainable and energy efficient houses can be a comfortable, luxurious places to live in. With the looks of it, the house is indeed a place where family and friends can come together. They can swing out by the lake, hang out on the terrace, or have an acoustic jam session by the fire. It also offers many avenues of engaging in culture, adventure, relaxation, and observation inside and out. The house is located near the pond which provides a panoramic view from the inside. Just look at this lovely surrounding! At night, the three-story volume comes alive with the glowing lantern that emerges from the landscape as it magically illuminates the water. I would love to live here! The facade of the house consists of limestone textured stucco, opaque tongue and groove polycarbonate panels, and two transparent volumes which project out of the second floor and seamlessly blend with the residence into the landscape. This bridge is extended to the pond where a pavilion is located. 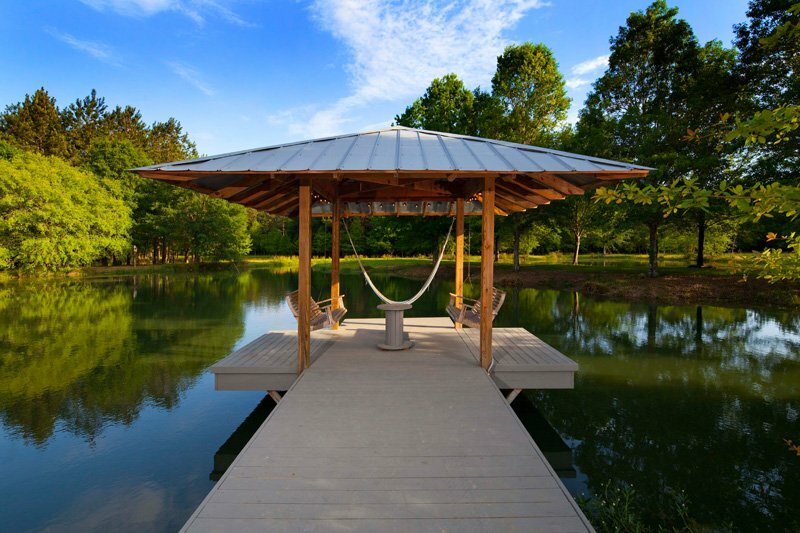 It has swing chairs and a hammock where the owners can get an ultimate relaxation here. The transparent surfaces of the house reveal a heavy timber frame. With that, the building becomes an observation tower with views to much of the site. 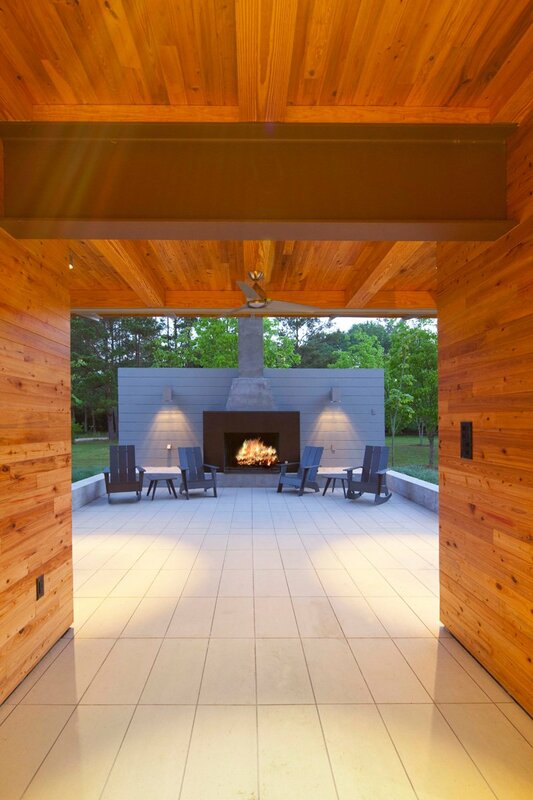 There is an outdoor fireplace where the family can spend time together. It also features a terrace providing a view of the beautiful surroundings. It used wooden flooring and wicker furniture. For ventilation, it has a ceiling fan. A set of wicker furniture is added in the house. It leads into the boat which can be accessed through the wooden steps. The dining area has a wooden dining set with black upholstered seats and backrest. Love the look of the area rug as well as the pendant lights and decors. While dining, they can get a good view of the surroundings too. Seen here is the kitchen with wooden materials and modern equipment. Notice that colorful area rug in the kitchen too. You can see here the shape of the house as well as the inclined or angled part where the staircase is inserted. Wood is the primary material used in the interior. A beautiful and relaxing family room where the family can watch movies or just enjoy the view from outside. Using black furniture, the interior of the house looked really gorgeous. Seen here is the powder room with gray walls and flooring. Of course, it leads to the toilet through the glass door. Wooden vanity is used here with a top mount sink. In this photo, you can see the polycarbonate panels that are transparent. Natural light from the sun illuminates the entire space. Notice that there is a shower area on the farther side. Cool, right? 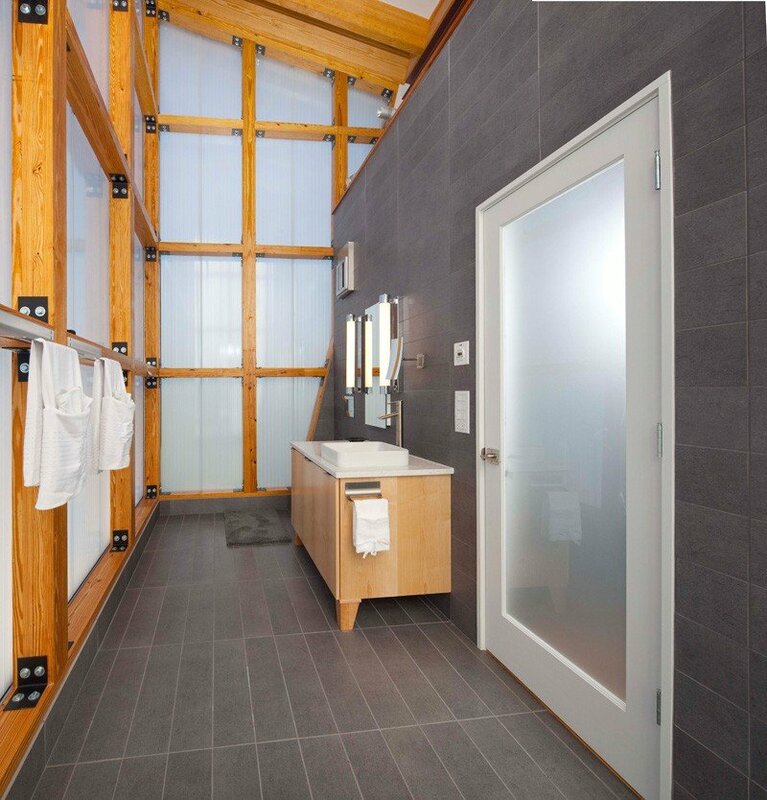 According to the Holly & Smith Architects, the Pond House “achieves net zero energy capability through active systems employing a high efficiency heating and cooling system, solar energy, spray foam insulation for a tight building envelope, energy star equipment, and LED lighting throughout. 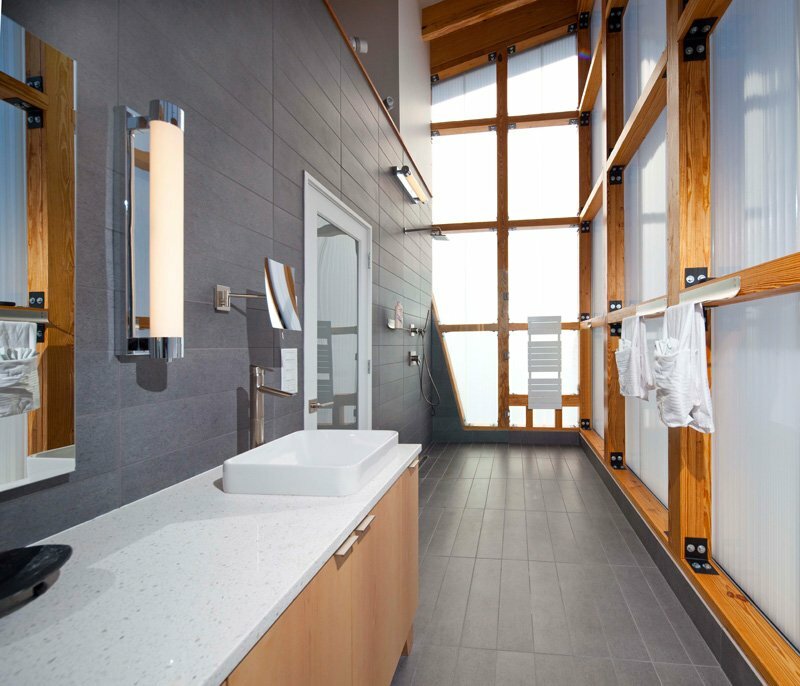 It also features passive strategies to achieve a sustainable design through operable windows for cross ventilation, north-south building orientation, natural day lighting, shading strategies, reclaiming materials, landscaping designed for solar and wind changes through the seasons, and managing rainwater onsite.” Isn’t that cool? It sure is! The house isn’t just about the views and the architectural and interior design. It is also about the different functions and sustainability features in it. 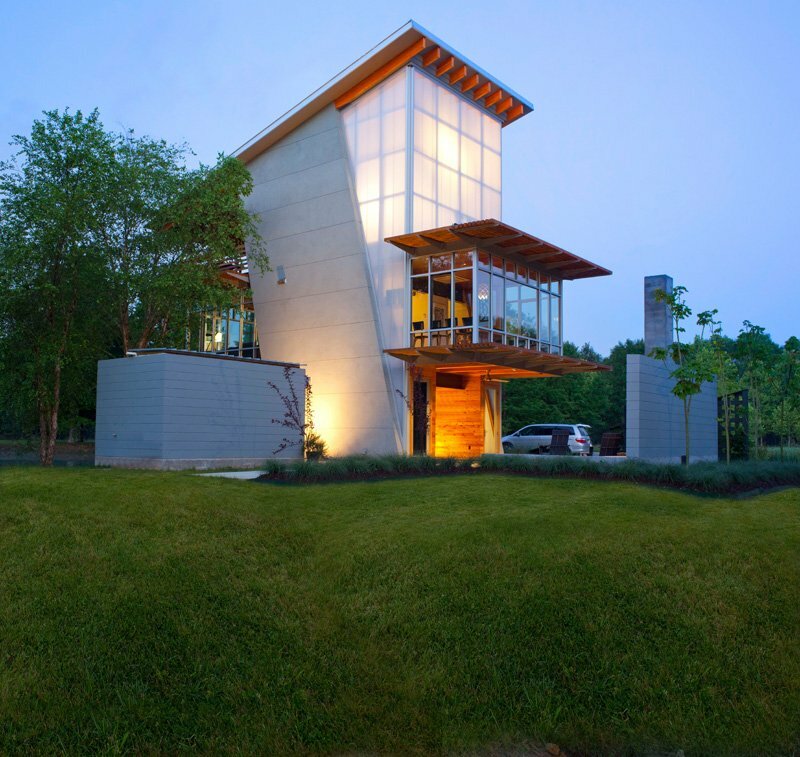 Indeed, this is one impressive design for a house! What are your thoughts about this house?